Part of our duty of care to animals is to provide appropriate housing/shelter for them. There is a demand for well-made animal housing across the whole range; from hedgehog boxes to entire stable blocks. Making nesting boxes for wild birds and other wildlife can also be a satisfying and profitable business. As with most things, the best way to learn is by getting involved! Find out if there is someone locally who works with wood and would be amenable to having an (unpaid) assistant. Consider home study/residential courses or evening classes in woodwork and find out as much as possible about what interests you. Working with wood takes time and patience, an artistic flair and practical skills. The work can be dusty and involve the use of strong-smelling preservatives and solvents. 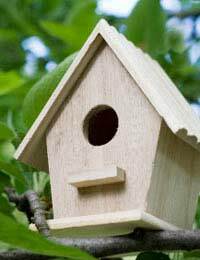 Garden centres and pet supply shops often stock bird tables and nesting boxes-lookaround at what’s available, make note of basic but attractive designs and research the types of materials used. Boarding kennels and general pet care stores will give ideas about the practicalities to be considered. Study the market! Make what will sell. Consideration needs to be given to where the animal housing can be made and where materials can be stored. If working from home, planning and other permissions/licences may be needed from local councils before starting the business. It is up to the individual to find out which rules and regulations apply to their situation. Some craftsmen start with one design that they do well and progress from there, but if they canmake a living and enjoy what they do, there is no pressure to make other types of animal housing! If a structure is to be erected on site, consideration should be given to wind direction and sunlight.Smells and dust particles are carried on the wind so position the housing for animals accordingly! Hens love to ‘dust bath’ in the sunshine but all animals need to be provided with shade too. Timber merchants supply a huge range of wood and most are happy to advise the keen beginner about the different properties of wood-shrinkage, warping, pliability, knotting, thickness and so on. They may offer trade discount to local woodworkers. Builders yards may also offer the same services as timber merchants. It is sometimes possible to recycle materials by using second-hand goods and adapting them.The strength and habits of the animals is an important consideration when making housing for them! Will it need a concrete base? How thick should the floor be to support the animal and keep rodents out? Could a rabbit gnaw through the wood? Will the Billy goat be able to jump over the top? If building with wood it will need to be treated with a weatherproofing preservative that will notharm the animal if they chew it. This is extremely important! If used, wire netting or mesh must be right for the job and attached to the wooden frame securely-without potentially injurious sharp edges sticking out. Ventilation grilles and windows should be secured in place and made fromsafe materials, that is, shatter-proof. Templates for the different sections of each structure enable the woodworker to reproduce accurate copies of a design each time. Make one for each type of kennel, hutch,hen house and nesting box, or whatever else you want to make. Dimensions should be checked to ensure the whole thing willfit together when all the parts have been made! If selling animal housing as flat-packed, a list of parts and instructions for assembly should be printed and enclosed for the buyer. Making animal housing can be a very satisfying job. With experience the process can be speeded up without losing accuracy or quality. Once a reputation has been built up future projects may comein by word of mouth and personal recommendations. Earnings depend on the quality of work and output!